Luxury car manufacturer Audi launched its new A8 sedan in the Indian market. The newly launched car is priced at Rs 89 lakh (Delhi ex-showroom). The German car major, a part of the Volkswagen group stated that it anticipates full-year sales to cross 4,500 units, depicting a 50% increase. The company is speedily growing in the country and is the third-largest luxury car manufacturer after BMW and Mercedes. Audi India MD Michael Perschke said, "The Indian market is expanding rapidly and Audi wants to enhance its product line-up to grow exponentially in the market." The company sold 3,003 units in the country in 2010 and state that it has plans to swell its net. "In 2010 we maintained the Number 1 position in Europe and China. Audi also became the fastest-growing luxury brand in the US and India. 2011 will see Audi India announcing many initiatives on product and network expansion," Perschke stated. 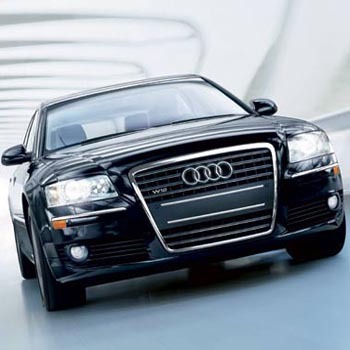 The A8 sedan fights with models such as Merecedes S-Class and BMW 7-Series. Audi's series in the Indian market comprises the A4 and A6 sedans and Q5 and Q7 SUVs.